Boris used to spend many hours analysing games at home and trying to spend as much time as possible at the Pioneers’ Palace. His idol was A. Alekhine, whose games tried to understand for hours on end. This helped him to become not only a universal chessplayer, but also left a very deep influence in his tactical skills. That work left an indelible imprint for years to come: like Alekhine he was able to play positional games full of strategical sparkling ideas or combinative attacking games in the 19th century Chess tradition. Like his admired predecessor, he was able in a rather subconscious way to reach positions charged with latent energy ready to explode in a given moment. He developed also a very precise insight to perceive and take advantage of the critical moments during games. 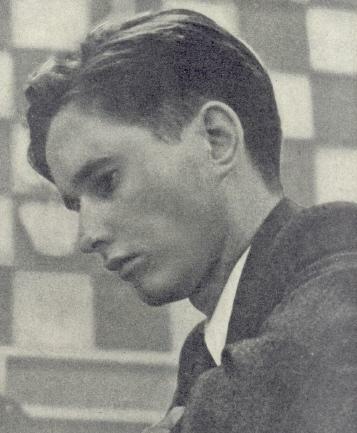 Many people know Boris as “the player who lost to Fischer”. But I must say he is one of the most complete and interesting chessplayer in the history of the royal game. If you devote time to study his games, the first thing you realise is the different sides his talent show. When you believe you know him quite well, a new aspect is revealed here or there. 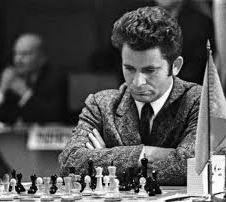 So, is it possible to train with Spassky?.- Absolutely yes. In this post I have included games to be studied/analysed and five exercises taken from his games. Good luck. 1. e4, c5/ 2. Nf3, Nf6 (an old variation of Hypermodern flavour .) / 3. e5, Nd5/ 4. Nc3, e6/ 5. Nxd5, ed5/ 6. d4, Nc6/ 7.dc5, Bxc5/ 8. 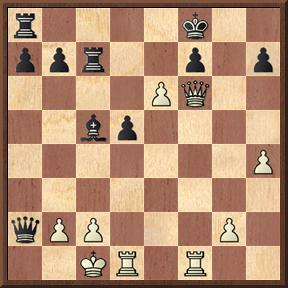 Qxd5, Qb6 (an old line already played in 1924. Black gets an aggressive position and White has to show he has something to counter it). 9. 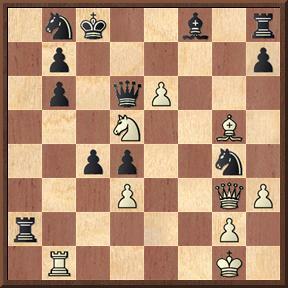 Bc4, Bxf2+/ 10. Ke2, 0-0/ 11. Rf1, Bc5/ 12. Ng5, Nxe5/ 13. Qxe5, d5/ 14. Qxd5! (A critical moment. 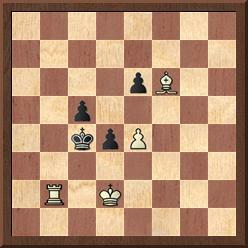 Spassky avoided 14.Bxd5 due to: 14…, Bg4+/ 15. Ke1, Rae8!/ 16. Bxf7+,Kh8/ 17. Bxe8, Qa5+ 18. Bd2, ,Bxf2+ and the White Queen is lost) 14…, Re8+/ 15. Kf3, Qf6/ 16. Kg3, Bd6/ 17. Rf4!, Be6/ 18. Nxe6, Rxe6/ 19. Qxd6. Qg6/ 20. Rg4, Re3+/ 21. Bxe3, Qxd6+/ 22. Kf2, Re8/ 23. Rf4, Re7/ 24. Bb3, Qe5/ 25. Re1, g5/ 26. Rf3, Kg7/ 27. Rd1, f6/ 28. Kg1, g4/ 29. Bd4 and Black resigned. Beautiful. 1. d4, Nf6/ 2. Nf3, g6/ 3. g3, Bg7/ 4. Bg2, 0-0/ 5. 0-0, d6/ 6. Nc3, Nbd7 /7.e4 (a GM weapon: the transposition of moves: what seemed a King’s Indian is now a Pirc) 7…, e5/ 8. a4, c6/ 9. b3, Re8/ 10. Ba3, ed4/ 11. Nxd4, Nc5/ 12. Re1, Ng4/ 13. Qd2, Ne6/ 14. Nde2, Qf6/ 15. f3, Bh6/ 16. f4, Qd8/ 17. h3, Qb6/ 18. Kh1, Qe3/ 19. Qc1, Qxc1/ 20. Raxc1, Ne3/ 21. Bd6, Nxg2/ 22.Kxg2, b6/ 23. Rcd1, Bb7/ 24. g4, Rad8/ 25. f5, Nf8/ 26. Ng3, Bg5/ 27. e5, Bh4/ 28. Kh2, h6/ 29. 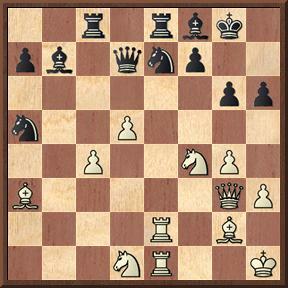 Rf1, Nd7/ 30. e6, Nf6/ 31. ef7, Kxf7/ 32. fg6, Kxg6/ 33. Nf5, Bg5/ 34. Kg3, Nd5/ 35. 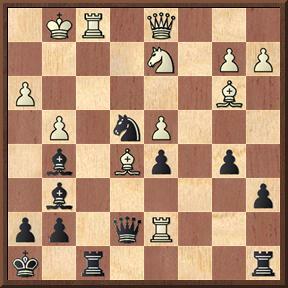 Nxd5, cd5/ 36. h4, Bf6/ 37. h5, Kh7/ 38. Bf4, d4/ 39. Nh6, Re2/ 40. Rd2, d3/ 41. Rxd3, Rg2/42. Kh3, Rxd3/ 43. cd3,Rc2/ 44. Rc1, Rxc1/ 45. Bxc1, Ba6/ 46. g5, Bc3/ 47. g6, Kg7/ 48. d4, Bc8/ 49. Kh4, Bxd4/ 50. Ng4, Bf6/ 51. Bg5, Bc3/ 52. Bh6 . Black resigned. 1. e4, e5/ 2. Nf3, Nc6/ 3. Bb5, a6/ 4. Ba4, b5/ 5. Bb3, Na5/ 6. 0-0, d6/ 7. d4, Nxb3/ 8. ab3, f6/ 9. Nc3, Bb7/ 10. Nh4!, Ne7/ 11. de5, de5/ 12. Qf3, Qd7/ 13. Rd1, Qe6/ 14. Be3, g5?/ 15. Nxb5! !, ab5/ 16. Qh5, Qf7/ 17. Rxa8, Bxa8/ 18. Rd8!, Kxd8/ 19. Qxf7, gh4/ 20. Qxf6, Rg8/ 21. f3!, h3/22. g3, Ke8/ 23. Qxe5, Rg6/ 24. Qxb5, Bc6/25. Qb8, Kf7/ 26. Qxc7, Rf6/ 27. Bg5, Re6/ 28. b4, Kg8/ 29. Qb8, Ng6/ 30. Kf2, Ne5/ 31. b5, Be8/ 32. Be3, Bd6/ 33. Qc8,, Kf7/ 34. b6, Rf6/ 35. Bf4, Bd7/ 36.b7, Be6/ 37. Bxe5, Bxe5/ 38.b8Q, Bxc8/ 39. Qxe5 and Black resigned. 1.Nf3, Nf6/2. c4, e6/ 3. b3, d5 (I think Spassky’s approach to Chess is classical. In these types of set-ups in which White cedes the center he always occupies it playing a sort of reversed Queen’s Gambit) / 4. Bb2, Be7/ 5. g3, 0-0/6. Bg2, c5/ 7. cd5, ed5/ 8. d4, Nc6/ 9. 0-0, Bg4/ 10. dc5, Bxc5/ 11. Nc3, a6/ 12. Ne1, Re8/ 13. h3, Bf5/ 14. Nd3, Ba7/ 15. Rc1, d4/ 16. Na4, Be4/ 17. Nac5, Bxg2/ 18.. Kxg2, Qd5/ 19. Kh2, Ne4/ 20. Nxe4, Rxe4/ 21. Rc2, Rae8/ 22. Bc1, f6/ 23. f3, Rhe7/ 24. Ba3, Rf7/ 25. Nb4, Nxb4/ 26. Bxb4, Qb5/ 27. Ba3, h5/ 28. Qd3, Qxd3/ 29. ed3, Re3/ 30. Rd2, Rc7/ 31. Kg2, Kf7/ 32. Rc1, Rc3/ 33. Rcd1, Ke6/ 34. Bb2, Rc6/ 35. Rc1, Kd5/ 36. Rxc6, bc6/ 37. Kf2, Bc5/ 38. Rd1, Bb4/ 39. a3, Bd6/ 40. Bc1, Re7/ 41. Bd2, Rb7/ 42. b4, a5/ 43. ba5, Rb2/44. f4, Ra2/ 45. Ke2, h4/46. gh4, Bxf4/ 47. a6, Bxd2/ 48.Rxd2,Rxa3/ 49. Rb2, Rxa6/ 50. Rb7, Ra2/ 51. Kf3, Rd2/ 52. Rxg7,Rxd3/ 53. Kg4, f5/ 54. Kxf5, Rxh3/ 55. Rd7, Kc4/ 56. Kg5,, c5/ 57. h5, d3/ White resigned. Pos. 1.: 1. e7!, Kg8/ 2. Qxf7, Kh8/ 3. e8=Q, Rxe8/ 4. Qxe6, Kg7/ 5. Qe5, Kg8/ 6. Qg5 and Black resigned. Pos. 2.: 1…, Bg4! !/ 2. f3, Bxf3! !/ 3. gxf3, Nxf3/ 4. Kh1, Qh3/ 5. Rf2, Ne1!! / White resigned. Pos. 3.: 1. Nh5! !, Nxd5/ 2. cxd5, gxh5/ 3. gxh5, Bg7/ 4. Bb2, f6/ 5. Bxf6, Rxf2/ 6. Re2, Qf7/ 7. Re6 and Black resigned. Pos. 4.: 1. e7! !, Bxe7/ 2. Qxg4, Nd7/ 3. Nxe7, Kc7/ 4. Bf4, Ne5/ 5. Qg7!, Kb6/ 6. Bxe5, Qe6/ 7. 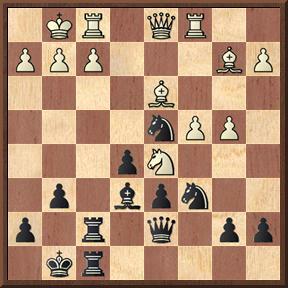 Bxd4 Black resigned. Pos. 5.: 1…., Qxc7! !/ 2. Bxc7, Be3+!/ 3. Kg2, Nxd2/ 4. Rxf8+, Rxf8/ 5. Bxd5, Rf2+/ 6. Kg3, Nf1+/ 7. Kh4, h6/ 8. Bd8, Rf8! !/ White resigned. How long do top chessplayers calculate?. Non players believe that the best chesslayers are able to calculate many many moves in advance. This is but a “cliché” (in the same way that many people believe that if you, a chessplayer, plays against a less-skilled or ocassional opponent you have to win in a few moves…). Steinitz declared that the matter depended on the level of his rival. Kasparov said that in positions with forced lines he could calculate around ten even fifteen moves. In other cases -complicated positions- he said that one has to rely upon his/her intuition + the positional understanding and in these case perhaps only from 5 to seven moves can be calculated. Some experts warn of the famous “two move principle” (the name is mine). Well, the mind of a professional does not work so strictly (I mean they do not care about these “scholastical” matters…) .They have a position in front of them and , generally speaking, know the plans associated to the opening played. Then, in an unconscious way, they begin to apply their knowledge of the position, the pattern recognition, their intuition, their ability to perceive immediate tactical nuances , their strategical knowledge and their positional insight. They are able to use a sort of goal-oriented thinking to take advantage of the assets or to determine that the opponent’s threats are more dangerous than his own and consequently he has to define a plan of defence. The term “horizon effect” appears related to artificial intelligence. In short: when evaluating possible future positions and decide where to stop the calculation, what would happen if the engine stops on move 10 and on move 11th there is a mate in one?. This tries to be avoided introducing what is known as “quiescence search”. In OTB Chess there are hundreds of examples where both players reach an opening position where both parties believe the advantage is on their respective sides. The ensuing play and the post-mortem analysis will prove who was right. In other cases one of the players has a better vision, calculates one step ahead ad is able to beat his opponent who had stopped calculating one or more steps behind his rival. Chess is very complicated, with many absolutely different factors intervening (even top GMs and World Champions have been defeated in less than 20 moves, for instance). Abrahams wrote that “the very best players very rarely make any perceptible tactical error. They lose by choosing a bad strategical line and persisting in it. They lose, in effect, by trying to do too much (or too little).” .- “The Chess Mind” (Of course all this under normal circumstances I add). Kotov wrote that you could find that some leading players might overlook a combination, but that you would never find one who calculated variations badly. 1. e4 c5 2. Nf3 e6 3. d4 cd4 4. Nd4: Nf6 5. Nc3 d6 6. Be2 Be7 7. 0-0 0-0 8. f4 Nc6 9. Be3 a6 10. a4 Bd7 11. Bf3 Na5 12. Qe2 Qc7 13. g4 Rfc8 14. g5 Ne8 15. f5 Nc4 16. Bh5 g6 17. fg6 fg6 18. Qf2! Ne5 19. Nf3! Ng7 20. Ne5: Rf8 21. Nf7! Nh5: 22. Nd5!! ed5 23. Nh6 Kg7 24. Qf7! Rf7:: 25. Rf7: Kh8 26. Bd4 Bf6 27. Rf6! and Black resigned. What a thrashing! 1. d4 Nf6 2.c4 e6 3. Nf3 d5 4. Nc3 c5 5. cd5 Nd5: 6. e4 Nc3: 7. bc3 cd4 8. cd4 Nc6 9. Bc4 b5 10. Be2 Bb4 11. Bd2 Qa5 12. Bb4: Qb4: 13. Qd2 Bb7 14. a3 Qd2: 15. Kd2: a6 16. a4 b4 17. a5?! Rd8 18. Ke3 f5! 19. ef5 ef5 20. Bc4 Ke7 21. d5 Kf6! 22. dc6 Rhe8 23. Kf4 Re4 24. Kg3 Bc8! 25. Rac1 Rg4 26. Kh3 f4 27 Ne5? (The losing move. It was necessary 27 Ba5:) 27. … , Kg5 28. Nf7 Kh5 29.Be2 Rd3 30. g3 f3 31. Rc5 Rg5 32. g4 Bg4: 33. Kg3 fe2 and White resigned.